April brings Michele Schuff to the Weir Farm Artist-in-Residence program. Co-sponsored by Weir Farm Art Center and Weir Farm National Historic Site and presented by Wilton Library. No charge. Registration suggested. The Hunter Museum’s annual art auction and gala fundraiser, the Spectrum 2015 weekend kicks off Thursday evening, November 12 with cocktails, heavy hors d’oeuvres, and the Silent Auction. Two nights later, on Saturday evening, November 14, guests will enjoy cocktails, a full dinner, and the Live Auction. Join us on May 17 to tour open studios, meet working painters, photographers, dancers, and sculptors and view their work in progress on Sunday May 17, 2015 from 1 to 5 p.m. Enjoy refreshments and explore the B Complex artists’ cooperative located in Capital View near Atlanta’s Historic West End. Free and open to the public. ART PAPERS 15th Annual Art Auction + Party, featuring an impressive showcase of work by 250+ famed and emerging artists from around the world, proceeds from the silent auction benefit the award-winning programs of ART PAPERS. This two-night event is the signature art party that kicks off Atlanta's art year. Please join us for collection-worthy art, great people watching, amazing music, a well-stocked bar, and complimentary bites and desserts provided by some of Atlanta's hottest restaurants. Speed up your entry into the Auction and save $10 when you purchase your tickets online. Project Art Lounge is pleased to announce its first exhibition featuring the works of Kamila Najbrtová, Michele Schuff and Silvia Sinha. In his poem “Light Breaks Where No Sun Shines,” Dylan Thomas refers to light as “glow-worms” or “tips of thought,” provoking images of light bulbs and candlesticks glowing in the darkness of night. These are the “things of light” that awaken our mind and body. Light is essential to the work of many artists and in this exhibit there is no exception. In the works of Silvia Sinha, Kamila Najbrtová and Michele Schuff we discover light in new and captivating ways. Silvia Sinha is a master of light. Her painterly photographs capture the rays of light as they cast down upon, flood and disect their subject. Her photographs do not simply record. They explore, re-interpret and dissolve boundaries, opening new vistas of interpretation and visual pleasure. Kamila Najbrtová draws you in to a deeper space. In her paintings, light is an invitation to look beyond the surface. 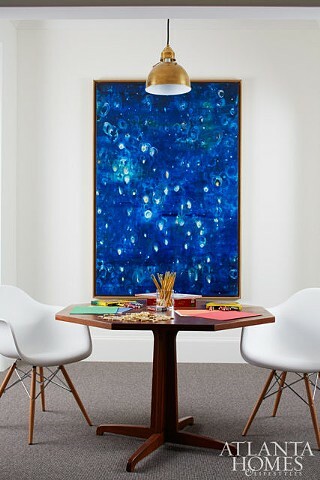 The paint floats on a transparent canvas creating an effect that is both hypnotizing and stimulating. The vibrant colors and warmness of the wooden frames tantalize your senses. Warmth is also what embodies the encaustic works of Michele Schuff. The glow of her sculptures and paintings conjure up thoughts and feelings of a kindled spirit. She, too, awakens body and soul, creating a state of consciousness where time, space and light melt together into one. The exhibition LIGHT BREAKS is the first in a series of projects presented by Project Art Lounge, which supports artists to reach new audiences by leveraging the power of the digital world. Please stop by and let us know you are coming. Walking into the white-walled halls of the Blackbridge Art Gallery , the constant beat of Michele Schuff’s internal metronome propels the spectator forward. The eye is drawn first to the bright yellow pieces on the left end of the hall, then to the deep blues on the other and finally to the neutrals, the browns, golds and greys, that lie in between. The exhibit, “Measure for Measure”, is by Atlanta artist Michele Schuff, whose work has been featured in exhibits all over the world, and is curated by senior art major Charlotte Maier. According to her artist statement, her inspiration for the works in the exhibition comes from time and different ways of measuring it, which she incorporates in her artwork through repetition and layering. The events in Schuff’s life at the time she was making this collection of works contributed to her obsession with time, or a lack there of. Schuff’s artwork is an exploration of a state of mind, achieved through complete concentration on a single creative task. All sense of time is lost, and the idea becomes all-consuming. “I imagined a space outside of time might exist when one is entirely engaged in some kind of creative work- where everything drops away and that one can tap into a completely alive, creative state of consciousness where time becomes irrelevant,” Schuff said in her artist statement. The exhibit consists of encaustic works and a single installation. Encaustic is an ancient art form used by the Greeks and Egyptians that involves a mixture of melted wax and pigment applied to a surface. Georgia College before the “Measure for Measure” exhibit. “I thought it would be good to bring in an artist that works with encaustic to GC, just to give people a kind of diversity,” Maier said. Maier, as curator of the exhibit, has led the process of the event from start to finish, combining her art major and event planning skills. During installation week, Maier’s role was to hang and install the art and the light bulbs, following the exhibition through, from concept to construction. Besides her unique medium, Maier says she also chose Schuff as her artist for her style and use of color and texture. Maier hopes the exhibition will bring in students that may not have an appreciation for art. 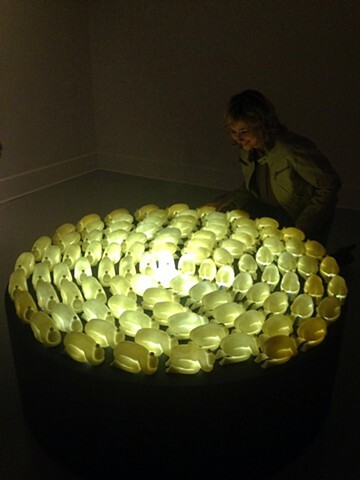 The exhibition changed sophomore psychology major, Ashley Granchamp’s, views of art. “It was interesting because it had a lot of different textures, which is weird to me because when I think of art, I don’t think texture. I think of paint on a canvas,” Grandchamp said. Schuff’s goal with the exhibit is to inspire students to follow their own path and do what they love. Measure for Measure, featuring Schuff’s encaustic pieces on time and space, runs from Sept. 23 to Oct. 18 in Blackbridge Hall Art Gallery. Art Reception: September 26, 5:00 – 7:00 p.m.
MILLEDGEVILLE, Ga.- Blackbridge Hall Art Gallery is proud to present Measure for Measure, an exhibition produced by Atlanta based artist Michele Schuff. This exhibition showcases the artist’s encaustic works as well as a historical overview of the encaustic method while exploring a wide variety of applications of this technique such as paintings, panels, and sculptures. Schuff uses her works to depict elements of time and measurement by using repetition and layering within each piece. Schuff’s ideas of time, light, and space are blended together within her works in a harmonious pattern that becomes both literally and figuratively melted together. These encaustic works take the psychological ideas of time and space and bring them into a vivid, visual reality. Schuff’s works use these ideas to encourage contemplation of our own personal and original living patterns while they become in tune with the patterns of the world around us. Michele Schuff received a Bachelors of Arts from Wayne State University and a Masters of Fine Arts from Georgia State University. Curated by Georgia College senior art major, Charlotte Maier, in fulfillment of her Museum Studies capstone thesis project. The nighttime darkness of rural places – including Hambidge – is often startling for those unused to it. Darkness can be magical and fearsome. It can heighten your senses, cause you to be introspective, to face fears, and it can make you crave light. For this exhibition, we have chosen Hambidge Fellows whose works incorporate light and darkness. Exhibiting artists are Wendy DesChene & Jeff Schmuki, Rich Gere, and Michele Schuff. We will also feature the work of several potters who make "shine" jugs (a rather different kind of light in the darkness), including Hugh Bridgeford, Colin Gray & Tasha Chemel and Tasha McKelvey. Das Mecklenburgisches Künstlerhaus in Plüschow beherbergt neue Stipendiaten. Kunstschaffende aus Österreich, Frankreich und den USA treffen sich im Rahmen eines Austauschprogramms im Mecklenburgischen Künstlerhaus. Dort können sie vier Wochen lang die Ateliers für eigene Projekte nutzen. Michele Schuff ist Amerikanerin und kommt aus der Kleinstadt Austell im US-Bundesstaat Geor- gia. Obwohl sie in der Hauptstadt Atlanta Malerei studierte, arbei- tet die Künstlerin für gewöhnlich mit Wachs. Aus diesem Material produziert sie normalerweise Skulpturen, die sie dann auf Lein- wänden oder als Installation farb- lich arrangiert. Überhaupt stehen Farben und Farbübergänge bei der Amerikanerin besonders im Mittelpunkt. Da sie nur einen Bruchteil ihrer Werkzeuge nach Deutschland mitnehmen konnte, stellte das Austauschprogramm ei- ne große Herausforderung für sie dar. „Vor der Zeit im Künstlerhaus Plüschow habe ich seit 20 Jahren nicht mehr mit Farbe auf Papier gemalt“, berichtet Schuff. Nicht zu wissen, was in Deutschland auf sie zukommen würde, habe sie fas- ziniert und zum umdenken ge- zwungen. Aus der materiellen Not machte sie eine Tugend. „Ich nutze meine Zeit in Mecklenburg nun bewusst dazu, mich von mei- nen normalen Projekten zu entfer- nen“, schildert die Künstlerin. Auf der Suche nach anderen Mög- lichkeiten, sich künstlerisch zu verwirklichen, kam sie zurück zur ihren Wurzeln. So arbeitet Schuff derzeit an einer Bilderserie aus Acrylfarben und an verschiede- nen Gipsfiguren. Die Amerikanerin Michele Schuff sucht im Schloss Plüschow nach neuen künstlerischen Ausdrucksmöglichkeiten. wissen, ob diese andere Seite über- haupt existiert“, so Schuff. stellen. Zwar ist das Ende von Mi- chele Schuffs künstlerischer Tätig- keit im Schloss Plüschow noch nicht erreicht, aber sie könne sich bereits vorstellen, dass die hier ent- standenen Werke ihre zukünftigen Projekte beeinflussen werden. Selected as the VCCA exchange artist for one month Schloss Pluschow artist residency in Mecklenburg, Germany. An artist can be both storyteller and innovator. Some have a preternatural ability to predict concerns that will soon encroach on our horizons. “Fables of the Eco-Future” presents artists who are preoccupied with the natural environment. They might envision an alternative future for the land, making plans and designing prosthetics for a new nature. They might develop spaces and objects in support of a healthy world. They speak of thriving ecosystems or devastated landscapes, expressing themselves through fantasy, reality, or an inventive combination of both. Curator Lisa Alembik will present a broad range of ideas and perspectives in this exhibition of work by Hambidge Fellows. On Saturday, April 27th, 2013, Hambidge will present a stellar showcase of art and performances at the Goat Farm in Atlanta. Our 18th annual auction will feature installations, videos and over 200 artworks up for auction representing emerging and established artists from across the country. Dynamic performances by poets, dancers, and musicians will inspire and entertain throughout the evening. Please join us for ART PAPERS 14th Annual Art Auction + Party, featuring an impressive showcase of work by 250+ famed and emerging artists from around the world, proceeds from the silent auction benefit the award-winning programs of ART PAPERS. This two-night event is the signature art party that kicks off Atlanta's art year. As always there will be collection-worthy art, great people watching, amazing music, a well-stocked bar, and complimentary bites and desserts provided by some of Atlanta's hottest restaurants. ATLANTA, GA - Stylists Thom Driver and Kim Phillips of Driver Phillips are pleased to announce the presentation of ZEN DIXIE, a multi-media installation of artworks curated by John Otte, set within an extraordinary historic Cabbagetown shotgun home. The exhibition will include drawing, painting, photography, sculpture, sound, video, and installation meant to resonate specifically with the home’s minimal, yet sensuous, aesthetic. Designed by architect Nicholas Storck in 1998 in collaboration with Kim Phillips and John Otte, "Zen Dixie" - the original working title of the 100 year-old shotgun house/modernist intervention - stands as a synthesis of architecture, design and art that honors both the raw and the refined. Artworks in the exhibition will inhabit the home’s unique environment, comprised of the historic and the new, exploring the potential for quiet reflection and meditative experience. Included in the exhibition are artists based in Atlanta and New Orleans: Lillian Blades, Dawn DeDeaux, Courtney Egan, Dave Greber, E.K. Huckaby, Fereydoon Family, Gyun Hur, Sonya Yong James, John Otte, Michele Schuff, Nina Schwanse, Wesley Stokes, Karen Tauches, Gregor Turk, Delona Wardlaw, and Christian Bradley West. John Otte, born in Virginia Beach, VA, is a native Atlantan artist/curator based in New Orleans, LA. Recent curated exhibitions include: CALIGULA, a multi-media installation of artworks by Wesley Stokes at Parse Gallery, New Orleans, June 1 - 29, 2012; Constant Abrasive Irritation Produces The Pearl, A Disease Of The Oyster - Lenny Bruce, 2011-12 at The Pearl, a satellite exhibition of Prospect.2 New Orleans, Oct. 22, 2011 - Jan. 29, 2012; Summer Falls at Whitespace Gallery, Atlanta, Aug. 19 - 29, 2009; and Entr'acte at Bush Antiques, a satellite exhibition of Prospect.1 New Orleans, Nov. 1, 2008 - Jan. 18, 2009. In addition to these curated shows, Otte will participate in an exhibition with his own new digitally-printed/hand-painted paintings at The Front Gallery, New Orleans, July 14 - Aug. 5, 2012. CREDITS: ZEN DIXIE is an ongoing project of Thom Driver and Kim Phillips Studio. Curatorial assistance is provided by Kristin Juarez and Karen Tauches. BAG is an artists’ studio and gallery facility in the Park Slope/Gowanus area of Brooklyn, NY. BAG’s mission is to help make it possible for artists to further their work and careers at a reasonable cost. Started five years ago, BAG also offers classes, critiques, figure drawing, library, kitchenette and all studio facilities. For more information, contact: mailto:info@brooklynartistsgym.com, info@brooklynartistsgym.com. In the final grouping, the artist sometimes uses a stencil, regularizing the patterns and building up the surfaces even higher. Composed of interlocking circles of gold with hints of red—the two final hues in the alchemical process--Solder Gold (2011) combines the perfection symbolized in the round, together with the illumination and sacred qualities inherent in the metal. Inspired by a cherry tree blooming outside her studio window, Schuff decided to cast the blossoms in wax, using these in bas-reliefs, such as Reprise (2011), where scores of wax blooms are set side by side, patterning the composition with a contemplative regularity. Varying in shape and in size, and placed more randomly, the indigo blooms of Don’t Go (2011) are set within a dim light, almost like flowers floating on a pool. For the artist, the work embodies the pain of losing someone you love. Bunched more closely together, the cast flowers of Big Blue (2011) graduate from a midnight hue in the wide border to a paler shade in the center, as though suffused with light. A complex symbol especially esteemed by the Japanese, the cherry blossom-- exquisitely beautiful but evanescent--symbolizes not only prosperity and the beauties of life but also the precariousness of human existence. Light is also pivotal to the final work of the exhibit, 48 Squares (2011). Composed of the same interlocking circles as the earlier work, the squares are arranged in a monumental grid, with their aqua hue –the color associated with the heavens--growing lighter toward the center, creating a soft, even illumination. Here the circle’s associations with eternity and completion join with the square, symbolizing the earth and temporality. The metronome’s insistent measure has been overtaken with an esthetic juncture of heaven and earth.